The release of the new vintage of the Cedarville Zinfandel is always an event at our house. We were first introduced to this unique vineyard (as is usually the case with all things Zinfandel) at a ZAP Festival in 2005. 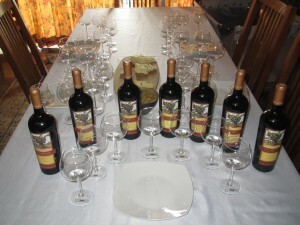 Having been introduced to the Boeger Winery Zinfandel the previous year, I bid on a package of a tour and a private dinner of both Boeger Winery and Cedarville Winery- a winery of which I had never heard. Although this seemed like a great idea after tasting a large number of delicious Zins at the dinner, the practicalities of getting 6 friends to the Sierra Nevada foothills of California from New Jersey proved somewhat daunting. So Sandy, a good friend, Pam, and myself met up with Sandy’s sister (a teetotaler) and her husband who lived in Sacramento to partake of this adventure. The first stop on this trip was a visit to Cedarville. This small vineyard is located in a spectacular setting on a foothill with the majestic mountains in the background. The winery is owned and operated by a couple, Jonathan and Susan. Having graduated from UC Davis from the enology program, they worked outside the wine industry until they could buy their own winery. They produce a number of tasty wines but the star (in my very biased opinion) is their estate Zinfandel. Our tasting was done in their unique wine cave constructed of preformed concrete bridge modules that were buried into the hillside. The vertical tasting consisted of essentially all of their Zinfandels vintages to that date and was accompanied by a mouthwatering array of artisanal cheeses and breads. Spending several hours with this incredible pair proved that wine making was a labor of love for them and this was reflected in a set of outstanding wines. The production is miniscule (500-800 cases per year) and the price unbelievable for the quality. Although the occasional reviews by the major wine publications support my assertion that this is a great wine (reviews usually in the 90’s), it remains relatively unknown. Cedarville has become the benchmark wine in our household for Zinfandel. Although we have “cult” bottlings for our wine snob friends, Cedarville is the choice when we want to impress. It was the wine served at my daughter’s wedding. Although complex enough to be served alone, the wines are surprisingly food-friendly for such big wines. With each release, we gather good friends and conduct vertical tastings of all of the Cedarville Zinfandels available from our cellar. One of the interesting observations we have had is that, although even the earliest vintages are good, there appears to be a gradual increase in the nuances and complexity of these wines- probably a combination of the vineyard maturing and the winemakers learning the subtleties of their vines, weather, and blending. Unfortunately, last year’s tasting emptied the last bottle of our 2005 vintage- one of the consistent favorites (guess that’s why it’s gone). 2012: This wine was recently bottled and tastes young. It has a beautiful bouquet of strawberries and raspberries. On the palate, it had nice tannins, a hint of tobacco, and cherries. The finish was long with spice and a slight sour taste. 2011: The bouquet was a relatively subtle spice and berries. The predominate taste was dark cherries and a hint of minerality (slate). 2010: Interestingly, this wine averaged out as the favorite of the flight but was not the number 1 for any of the tasters. It had a medium bouquet of black raspberries. On tasting, a variety of red fruits spice and earthiness was noted. The finish was relatively short. 2008: This was the least favorite of the flight but still fairly good. Amongst the berry and spice, there was a strong minerality, earthy/tobacco, and smoke but also a sour overtone. 2007: This wine had the most divergent rating- tasters either loved or hated the wine. It had a strong red fruit bouquet, with cinnamon, black pepper, and clove spiciness taste, and a long finish. 2006: This wine had a relatively soft cherries/plum start but had a strong finish with bramble and coffee tastes. 2004: This was several tasters’ number one choice. The bouquet is weak but has a very nice, rich plum, strawberry jam, and cherry taste with a nice finish of chocolate. We like to try each of the wines with a variety of foods to gauge its “food-friendliness”. Without meaning to, the choices of food ran to the earthy tastes. The tapenade was somewhat salty; the sausage was mid-level spiciness with typical sausage fattiness; the Taleggio cheese was excellent with an earthy overtone; the Gouda tasted like truffles with minimal cheese taste; the cloth-bound Cheddar was very earthy; and the mushrooms were prepared with a very light cream sauce. The average of “enhances”, “neutral”, or “detracts” ratings for each vintage on the wine taste/ the food taste are given in the chart above. The individual ratings are interesting but the more important message is that none of the wines were “food-unfriendly”. Several of these vintages, most notably the 2012 and the 2004, worked very well across the range of foods in enhancing the flavor both in the wine and the food- the ideal situation for serving wine with a meal. Everyone left the event happy (7 wines, 5 people, hmm…) and looking forward to drinking these beautiful wines and watching how they will age.